» Forum » Tech » Tech: Generic » Longest something was broken and you didn't know it?! » Longest something was broken and you didn't know it?! Longest something was broken and you didn't know it?! After owning my TZ for almost a year, I just realized that the GI doesn't dim. It's either off or full brightness. Not sure how I missed this! But I do remember thinking that TZ certainly didn't do much with the GI. Duh. What is the longest something was broken and yet you didn't realize it? I had my first machine Hurricane for a year and a half before I decided to do my first playfield teardown. Only realized then that half of the GI was out. Owned my Addams Family for over 10 years. Shopped it out and realized it was missing a little gate in the ball kickout area under the apron. The coil that kicked the ball out was so dirty that it worked just fine all that time. However after being properly cleaned, it would shoot the ball up so hard that it would bounce back down to the drain hole over and over. It was not until that moment I knew something had to be wrong. I owned High Speed for probably 4 months before I realized the diverter did not function properly. I really had no time on the game prior to purchase it was playable and not beat up for $450 I ran to it. I was able to soft plunge both locks believe it or not. Takes some finess. So much easier when ball diverter portion worked properly. Played a broken routed Addams Family for a long time. Never thought the thing flip did anything. After playing a working one, I thought Thing Flip into the swamp (ooze, toxic waste, it's all ours!) was only in the Gold Roms. Now years later, owning an Addams with regular roms, I realize that the swamp animation has always been in the game. lol. Black Hole dip switch to get extra ball instead of replay for reaching score levels. 10years that game never gave me any free ball. It owes me now. I just recently replaced the confirmed bad DIP switch, and if it wasn't for the Pinside thread and chit chat well i would have never really thought about it. I had my TSPP for two years before I realized the upper playfield ball lock and switch for the modes wasn't working. I was doing full shop on it when I realized it. The play is much funner now. I enjoyed reading these. Anyone else have one to share? Bought game with flasher fuse out. Played for months thinking they were part of jackpot show or something. If I didn't know it was broke, how could I know how long it was broke for? Just yesterday I noticed that the flasher under the right inlane guide on my HS2 was out. There are so many other lighting effects firing all the time that I never noticed it had a flasher there. It might have been out for years. Picked up a HUO LOTR in absolutely perfect shape...almost. Didn't realize that there was a magnet inside the ring and also a light inside the ring. I was at Expo this year and played the LOTR there and realized that these were out on mine. Replace a burnt fuse for the magnet and finally locate the bulb that's out for the Ring hole and now all is good. I will second the Light in the LOTR Ring. Had mine 2 years before I realized it was there. STTNG had SEVERAL (I think four) optos out... But never got a technician alert. Only figured it out when a divertor arm got out of alignment and the game couldn't clear balls/constantly ball searching forced me to comprehensively check it out. Come to think of it, I RARELY get an error dot from TNG. Is there a way the tech alerts could be disabled/set to absurd settings that won't detect anything? When I did a real evaluation, I found previous owner had sloppily soldered some connections directly onto pins of trough board and the 16-opto board. Had to remolex them as well as opto fix. And had to fix thin copper wire of coil to connector on the solenoid that drops the drop target. Don't know how long ANY of those problems were there because of absence of tech alerts and initial unfamiliarity with how game should play. But now I THINK its working great (now that I finally fixed the reset when Borg ship launches ball)! JM left diverter was missing, not broken. Probably about 10 of us here were missing it. Just a small metal bracket not obvious. And I third it (along with seconding the magnet)! 6 months later I was playing someone else's LOTR and was like "What the hell???" Burnt fuse for the magnet and a bad bulb. Obviously the magnet changes the game, but the light in the ring is also cool as you hit the spinner. I don't have much, but this is a great thread. A lot to be learned here. My Family bought my Fish Tales in 1997 and I had no clue the topper's eyes lit up until 2 years ago when I saw it at Chicago expo. Sometimes I break wind and nobody ever notices. When I break wind, everyone notices. Wait there is a light in the ring on LOTR. Damn I have had that game for 4 years and never noticed. The magnet works fine though. I'm dumb. I'll let you know when I discover it. on a Roadshow, did not realize the switch at the top of the falling rocks habit trail existed. I kept thinking that it was not really much of a skill shot to get the extra ball when lit, since you can plunge it hard and have it roll back. Forget how I finally realized it was there and broken. One of those, duh, moments -- it made no sense, so why did I never look at it. I also had same flasher in the LOTR ring. Was playing someone else's and thought, I don't remember that flashing. Bet that happens a lot that the bulb gets smashed. Bought DE STAR WARS in 2005. Went to trade show in 2009 and saw a SW. 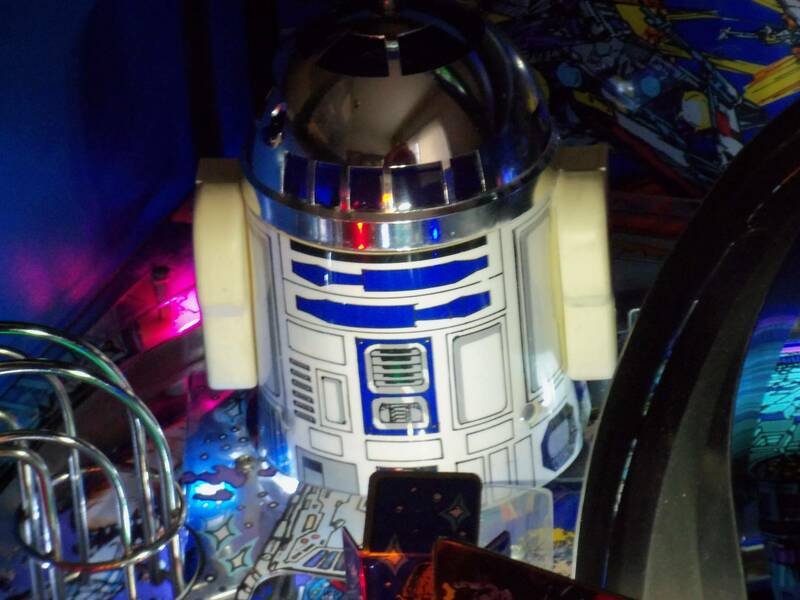 I noticed the head of R2D2 would move left to right. Mine never moved. Ordered a motor and all was good Four years later. the light in the ring on LOTR is actually under the playfield not behind the ring...take a peek...you'll find it. I put a blue LED in there and it looks awesome. The Getaway...I didn't realize that the locked balls should be released one at a time for 2 years until I played a friends Getaway. Mine all released at once. Gummy coil sleeve. Damn. Haven't had any in my own games. I read the rule sheets, stare at photos and watch videos obsessively once I decide I want a game, so by the time I've got it I know everything there is to know about it! But it has happened a lot for me with routed games when I started getting into pinball. They were they only examples games that I had played so I didn't know any better! Scared Stiff had a bunch: extra ball light was out and I didn't know how to get it. One-way gates weren't working above the Deadheads so they were hard to get (I had to use the spider awards to get them most of the time). I never realised there was a slingshot below the skill shot hole because it didn't work! I also had no idea there were actual leapers and that they jumped! I loved the game already, but loved it even more when I played a decent example some time later. We're talking about the light that flashes with the ring spinner, right? For me, that's behind the ring, not under the playfield. 9th vertebrae in my back. Broke it when I was 9 and didn't know until I was x rayed for something else when I was 32. Didn't know there was a flasher behind the ring on LOTR for a long time until someone mentioned it. I played a POTC on route for a while. Finally was able to buy one. I had no idea that the ship went down into the playfield! Must have been disabled on the route machine. funhouse. I always noticed that the backbox lights in other machines blinked but mine did not. Owned the thing for 11 years before I discovered that certain slots need the self blinkers (455s is it?). It was awesome to do the simple bulb change and get the blinky blinky. It was awesome to do the simple bulb change and get the blinky blinky. Does NGG use those lights? I heard that it did. In my backbox on the black sockets, there are just regular bulbs. Are these supposed to be 455s? I don't know that machine well, but it sounds like they should be 455s. Had my TZ about 5 months before I realized the lower pop bumber was not kicking - kept hating the fact that balls exiting town square would roll off of it and go to the outlane or right down the center. Never got a bad switch warning. The switch just needed an adjustment and now works fine. Does make you feel kinda like "duh". Over 2 years till I figured out my HS2 didn't work correctly. It should have released one ball at a time on multiball. Mine released 3 balls at once. "If a switch is not activated in 30 games, or is permanently closed, the switch is assumed to be bad. This will create a test report, which is shown when the game is turned on"
It wasn't scoring the top right loop switch. Kind of easy to overlook this because the spinner is right in front of the top right loop gate, and the spinner has your attention more.